Joining technologies are based on brazing processes that use eutectic alloys of silicon-titanium-chromium intermetallics for the joining of monolithic or composite silicon carbon. These alloys have a high operating temperature (1200°-1400°C) and good chemical-physical compatibility with silicon carbide. The joints produced have high sheer strength values (150 MPa for monolithic silicon carbide and 80 MPa for the composite). B.Riccardi, C.A.Nannetti, J.Woltersdorf, E.Pippel, T.Petrisor. 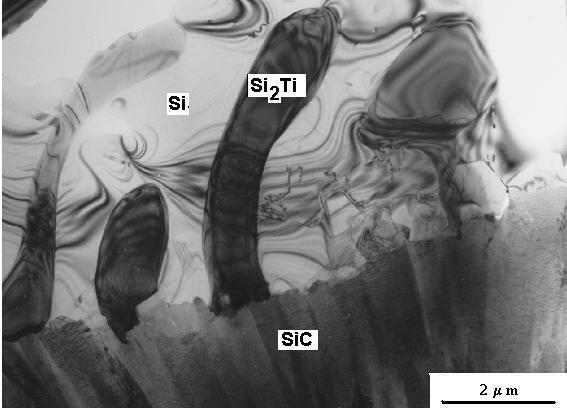 Brazing of SiC and SiCf/SiC composites performed with 84Si-16Ti eutectic alloy:microstructure and strength. Journal of Material Science 37 (2002) 5029-5039. B.Riccardi, C.A.Nannetti, J.Woltersdorf, E.Pippel, T.Petrisor. 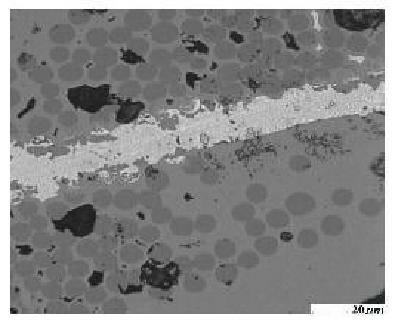 High temperature brazing for SiC and SiCf/SiC Ceramic Matrix Composites. Advanced SiC/SiC Ceramic Composites: development and Applications in Energy Systems, A.Kohyama, M.Singh, H-T.Lin and Y.Katoh eds, Ceramic Transactions Vol 144, The American Ceramic Society, Westerville (OH), 2002, pp 311-322.